Limited Space, the shopping mall media specialist, is continuing the rollout of its brand new Orbit digital screen network, with the installation of a large 7×4 metre screen at intu Metrocentre, Gateshead. As well as delivering a high definition dynamic display at 4.8 pixel pitch and full audio as standard, the screen is the second site in the Orbit portfolio to use specialised rotational technology. In addition to linear, interactive and dynamic content, as part of a creative DOOH experience the screen can seamlessly move from landscape to portrait to deliver unique, impactful and memorable campaigns. The screen launched running a campaign for Virgin Holidays to promote vacation deals to popular destinations including Florida and Tobago. 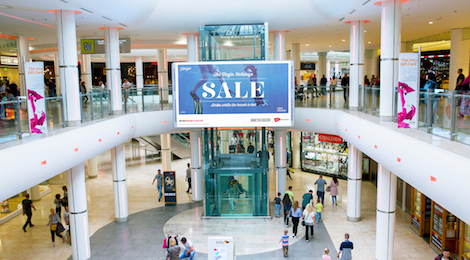 Limited Space’s Orbit network will continue to expand with installations planned for intu Milton Keynes and St Enoch over the next few weeks, taking the entire network to a total of 16 giant landscape screens across 12 flagship UK shopping malls. intu is the UK’s leading owner, manager and developer of prime regional shopping centres with a growing presence in Spain. They are passionate about creating uniquely compelling experiences, in centre and online, that attract customers, delivering enhanced footfall, dwell time and loyalty. They own many of the UK’s largest and most popular retail destinations, with super regional centres such as intu Trafford Centre and intu Lakeside and vibrant city centre locations from Newcastle to Watford. This entry was posted on Tuesday, September 5th, 2017 at 05:55 @288 and is filed under DailyDOOH Update. You can follow any responses to this entry through the RSS 2.0 feed. You can leave a response, or trackback from your own site.